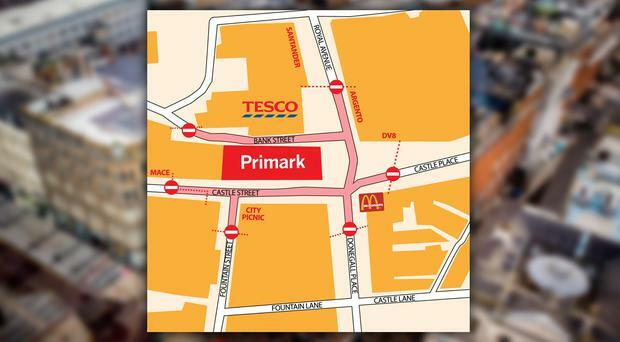 A campaign to draw more shoppers and revellers into Belfast to boost trade following the devastation of the Primark fire will be launched in coming weeks, the Belfast Telegraph can reveal. It emerged last night that meetings were taking place between Belfast City Council, Visit Belfast and other parties about a campaign to urge shoppers to keep visiting the city's shops, bars and restaurants. 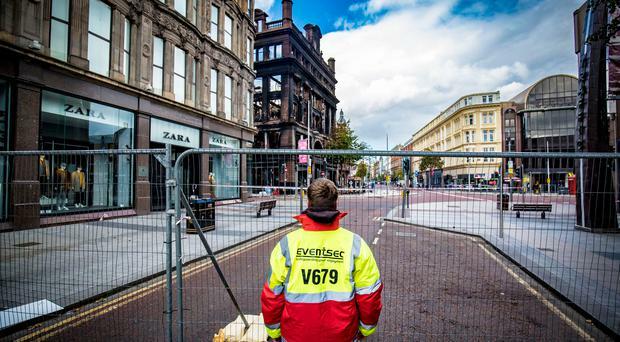 A safety cordon thrown around the site close to Bank Buildings on Royal Avenue has left 14 businesses unable to open, with Belfast City Council confirming that it will remain in place for at least four months. That is likely to mean restrictions on retailers in Royal Avenue and the surrounding area in the run-up to the key Christmas trading period. Already, retailer Emma Best, the owner of a Mace on Castle Street, said her trade has almost dried up. The Backin' Belfast campaign of 2013, which was launched to draw shoppers back into the city after the Union flag protests, which began in December 2012, could provide a template for the drive to get shoppers into Royal Avenue and the other nearby areas affected by the fire. As well as the 14 businesses within the cordon, many more traders in the surrounding area are suffering. One businessman said his footfall had fallen by up to 90% since the fire on August 28. Glyn Roberts, chief executive of Retail NI - which represents independent traders - said: "Retail NI is very keen to help support efforts. "People shouldn't forget that Belfast city centre is an integral part of the Northern Ireland economy and effectively the driver of our entire retail sector. "Even without Primark, Belfast City Council still has a fantastic retail and hospitality offering, but we do need to start a campaign to reach out to shoppers to ensure we continue to have footfall in the run-up to Christmas, which really is harvest time for the retail sector." Secretary of State Karen Bradley is expected to visit traders on Monday to offer her support. A spokesman for Visit Belfast, the body responsible for drawing visitors to the city, said: "Visit Belfast is working with Belfast City Council and other partners to deliver a marketing campaign for the city that will support businesses by driving footfall into the city centre. "It will rally support and restore confidence, showcasing everything Belfast has to offer. "The campaign is under development and will be activated in the coming weeks to support businesses in the city while the cordon remains in place." Belfast Chamber of Trade will also be part of the campaign, along with Hospitality NI, the organisation which represents bars and restaurants. Speaking at an event in London on Wednesday, Secretary of State Karen Bradley said she had seen the severely damaged building for herself during a visit to Belfast last weekend. And she said Heritage Minister Mike Ellis had texted her to draw her attention to the fire. "I am concerned now about the people employed there and for the businesses around there," the Secretary of State explained. "I saw it myself at the weekend and it's a horrible site to see - a beautiful historic building looking like that." In March 2013, the Belfast Visitor and Convention Bureau released figures showing that the #backinbelfast message had reached millions of people through social networking sites, including Twitter, Facebook and more. John Keane, managing director of Ardmore Advertising, described it at the time as "one of the island of Ireland's most successful civic social media campaigns".